Where do I even begin about this past weekend?? Let’s start with Saturday morning. I hadn’t slept much the night before, and despite setting my alarm for 6:30, I was wide awake before 5:00 am. Pre-race jitters? Not entirely. Quite a few of you reached out after my “runner’s low” post (thank you!! ), so let me offer this quick explanation. Speedy broke things off with us about a month ago, shortly after our Moonlight Challenge race together. The sense of loss was palpable. He was my running partner, my life partner, my partner-in-crime… I thought we were going to conquer the world together hand in hand, taking a few wrong turns along the way, but ultimately moving forward as an unbreakable pair. Coming to the realization that that vision was one-sided was… well, for all those who have been through something like that, I probably don’t need to say much more! The running ground to a halt. The one thing I loved to do, the one thing that always got me out of any situation, just slipped away. Every time I tried to get out there, I would make it to about 30 or 40 minutes before I simply couldn’t breathe anymore and my legs stopped moving. I wasn’t just heart-broken – I was lung-broken, leg-broken, and, with the complete loss of appetite, stomach-broken. As with any other sort of “injury”, with time, things got better. I started to breathe easier, run lighter, and go further. Friends and family, like any good support crew, got me through the right ‘checkpoints’ and pulled me right through the black fog of my ‘runner’s low’. I even made it up to a two hour run about a week ago, thinking that perhaps that would be just enough training to get me through this race. Well, I swam. It was more of a doggie paddle than a front crawl, but I swam. I gotta say, it wasn’t the easiest race in my life… In fact, I can say without a doubt that it was infinitely harder than my 100 miler. But the point is that I did it!!! Pre-race photo with a fellow RacingThePlanet competitor... They're everywhere! 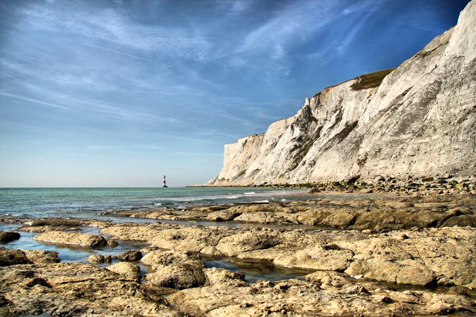 We started off from Birling Gap out towards the water and ran along the cliff tops, passing through Seven Sisters, and Beachy Head. It was a perfect morning. The mist coming off the ocean was glowing in the sunlight, which gave the race start a rather majestic quality (or “mist-ical”? Ha, sorry, I couldn’t resist). Runners were stretched out in a line in front (er, with hopefully a few behind! ), snaking up and down the hills for miles. Of course, just to take the pressure off, I pulled a classic ultrarunnergirl move and let my clumsiness rear its ugly head early on in the race. Just as I was starting to work out the kinks in my legs, I came up to a cow gate on the course. I had thought that the person in front of me had left the latch open, so I ran into it full speed… Ha! I may have actually ricocheted off the gate from the sheer force of the impact, but not wanting to look like a wimp to the runners behind me, I smiled and pretended it was toooootally planned. The bruising and bleeding on my thigh and knee would have to wait until later!! Keep calm and carry on! I was really caught by surprise by the hills. I knew part of the course was on the South Downs Way, which I have run over before, so I arrogantly dismissed the “strenuous” rating by Endurance Life as being blown out of proportion. Hmph, how hard can a few rolling hills be? Very hard. Lesson to be learned: never underestimate Endurance Life!! I kept up with some of the faster women for the first 15 km or so – maybe even up to 20 km – but after that it was downhill (or, er, uphill). The difficulty of the course meant that I was spending a lot more time on my legs than I had trained for and I was already hitting 2.5 hours at the halfway mark (13 miles). The molasses effect slowly but surely crept into my legs…. I chatted with a few other runners along the way, which helped, but by the time I got to 15 or 16 miles I was really struggling. I wasn’t drinking a lot of water and I couldn’t seem to get any food in me. Truth be told, I had thrown up my breakfast that morning before the race and I knew I really needed the calories or I would shut down! Even running through the desert in Namibia or the outback in Australia, I never lost my appetite. It was a strange thing to experience. Back to basics. Rule of the game is no matter what happens, keep moving forward. Sometimes, it is all you can do. At this point, the 10km racers overlapped our course and this was probably the most demoralizing section of the race. I thought I was doing pretty well under the circumstances until all of a sudden these fresh, bouncy, FAST runners just blew by me with ease! It was like I was chugging along in the slow lane on the highway, running out of gas, being passed by formula one machines at break-neck speed. Oh dear. Luckily, and this really was a saving grace, one of the other marathon runners trudged his way to my side and said that he recognized me from the Moonlight Challenge Race. He (Paul…right?? Did I get that right??) was having a tough race as well so the two of us forged our way together for quite some time. Every time I went downhill, I would get a massive, sharp stitch in my side that just wouldn’t release. This made me almost crave the uphills. Then the calf muscles started to go. It felt like there were animals jumping and crawling their way up to my hamstrings. It was the weirdest feeling – I’ve never had things shut down like that before. Paul must have noticed my random spaz outs because he mentioned that his quads and hamstrings were severely cramping as well… What a pair! We made it to the 19 mile checkpoint and, thinking I had a full pack of water, I drank just two glasses and carried on. Five minutes later I felt the water supply in my camelbak tube run out and realized I had made a huge rookie mistake. With the amount of cramping going on, it would be touch and go as to whether I would be able to make it to the next checkpoint. Silly me. But I thought there would be a way out. We weren’t in the desert after all. It was England! All I needed to do was find a stream and I could fill up… When I finally came across a greenish-brown, murky pond at the bottom of a cow-dung-infested field a few miles later, I was so desperate that I turned around to Paul with an inquisitive look on my face that said, “Do you think…. ?” Being the smarter one of the two, Paul firmly said “NO” and gave me a few sips of his water. He most likely saved me from dysentery with that move, and I will always be grateful!!! He ran out of water himself a few minutes later, so this was definitely a generous sacrifice. Paul (if I didn’t get your name wrong! ), please keep in touch. I’ve got your back in the next race! By this point, we just needed to finish. There were rumours of another checkpoint at mile 23 or 24, but Paul’s GPS already said 25 and nothing was in sight. The next little bit was a blur, but I remember BARELY moving… I was determined to keep trying to run. I saw some elderly couples strolling along the path and immediately scanned to see if they were holding water. I’m not sure what I would have done if they were. There was one person holding a can of coke… I had delusions of tackling the caffeinated-goodness out of this person’s hand, but realized I was in no shape to run away quickly enough, so that went out the window, along with my sense of morals. Paul and I ran past a farm and scoured for outside taps. No luck. Then we came across a pig’s trough in the middle of a field and actually contemplated, for a brief moment, filling up. Desperate times call for desperate measures? A little while later, some girls gave me some sips of their water and passed me a gel, but I was in a bad state. I finally made it to that last elusive checkpoint, and couldn’t have been happier to see my friend Rob!!! Rob had come down to do the race with me and despite being a 2:30-2:50 marathoner, he was obviously struggling to be as far back as I was in the race! There weren’t a lot of words said at this point, but we made it to the finish line side-by-side. It was just 2 or 3 more miles from that last checkpoint, but it couldn’t have felt longer. If Rob hadn’t have been there, I would hate to think how long it would have taken me to reach the end. The animals in my legs were jumping well past the knee and my head was spinning. We made it in just over 5 hours (ack!!! ), although the timing chip didn’t record my finish so it came up as a DNF (which I’m trying to get the race organizers to fix! Definitely didn’t go through all that to get a DNF!). Far from a DNF, that race was a grand finish. I knew it would be incredibly tough – for many reasons – but I needed to just do it and show myself I could get through it. There is something truly exquisite in putting yourself up to a challenge, even an enormously painful one, and succeeding. It may not have been a ‘win’ for me in the strictest sense, and, in fact, is probably my worse race placing so far… but it is a race I am very proud of. Am I signed up? You betcha. For the ultra. Can’t wait. Ultrarunnergirl may be running solo now, but with the cheering squad I’ve got in my corner (you know who you are! ), I’m ready to take on the next challenge – race or otherwise. Not only can I stand on my own two feet, I can run on my own two feet again. Way to get back out there. It’s very impressive how you worked through everything to finish. Hope you recover well for the next one! Thanks, Michael! All for the best. Plenty of runners on the trail (fish in the sea???)! Already back running a couple hours a day again. Next race in a week and a half. Very much looking forward to it!! I was trawling the net, looking at ultra running stuff and I came across your site and I see I am mentioned in one of your reports. I remember the agony of those hills, the cramps and running out of fluids. Oh and you would have definately got dysentery if you drank the water. Apologies for not speaking to you after the race, I was in a world of pain. Never again will I try out a new pair of insoles on a marathon. 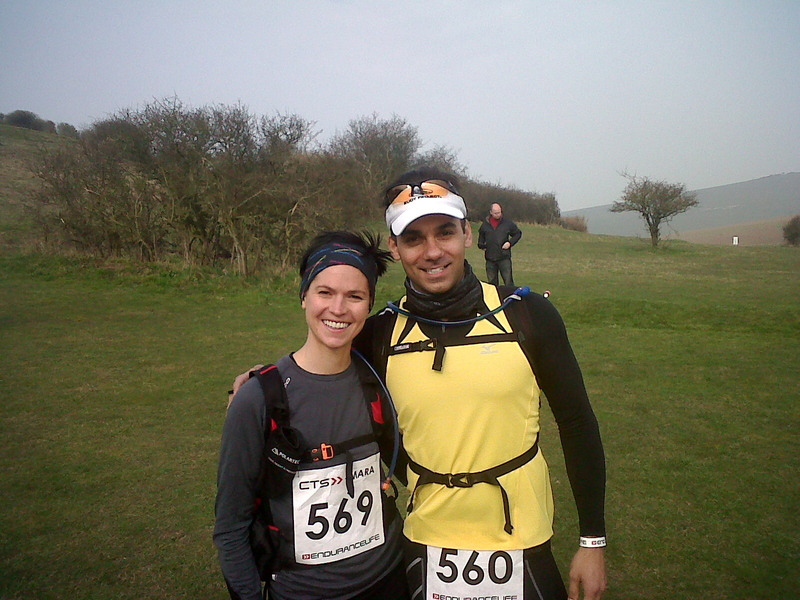 I did however manage to get some good racing in last year with the highlight being the 104 mile South Downs Way. It gave me four points towards the UTMB. And by some miracle, as the entry was mega over subscribed I have secured entry in to this years event, cannot wait! Chamonix here I come! Congratulation on winning the racing the planet Nepal race. Outstanding! Good luck at the UTMB. I fly out on to Chamonix on Wednesday. I have not heard of too many athletes going to Afganistan as part of their training for one of the worlds toughest foot races! Complete madness, but admirable. If I don’t see you out there, have a great run. How are you feeling post-Cham, Paul?? Hope you’re relaxing!!! Keep me posted on your upcoming races!